STAR TREK: Kirk and Spock - What could've been | Warped Factor - Words in the Key of Geek. Tom Pheby continues his new weekly Star Trek column by taking a look at two of the actors originally considered for the leading roles of Captain Kirk and Mr Spock. As I already revealed in my list of lesser known Star Trek facts, in the early stages of Star Trek's production the USS Enterprise was called the USS Yorktown, this was possibly after the aircraft carrier of the same name that was commissioned by The United States Navy in 1937 - it also ties in with Roddenberry's career as a decorated combat pilot. "These are the voyages of the star ship Yorktown." - It doesn't have the same ring, does it? In the same way that the word 'Enterprise' is now forever connected to the legacy of Star Trek, so are the two actors William Shatner and Leonard Nimoy. However, neither of them were originally pursued for the series. Like many other television shows several different actors were considered for the leading roles first. So lets take a look at two of them, who, if they had accepted the parts, may have completely altered the feel of the entire show. 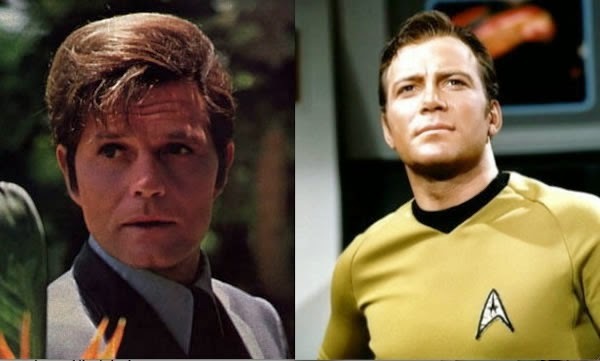 Obviously Kirk ended up being played by Canadian actor William Shatner, but would you believe that Jack Lord (Hawaii 5-0) was initially considered to play the role? Lord, Who's real name was John Joseph Patrick Ryan, was a well known Broadway performer and film star around that time. He hadn't reached the level of lead actor, but he'd appeared in a number of Westerns, and also portrayed Felix Leiter in 'Dr No", the Big screen debut of James Bond. On the strength of these performances he was considered for the role of Eliot Ness in the Untouchables, narrowly losing out to Robert Stack. Lord was emerging as a bit of a pin up and his his personal profile was on the rise, thanks to a steady stream of job offers. In terms of the role of Kirk, it would appear that the main stumbling block was that Lord demanded 50% ownership of the show, which was unsurprisingly deemed as totally unacceptable. You can see why he would be considered for the role though, Lord had a powerful charisma and could have reflected the attributes of Kirk superbly well. Eventually, of course, he went on to find international Stardom in Hawaii 5-0 (1968-1980) playing Steve McGarrett. Had the Star Trek deal panned out we may well have missed out of that classic catchphrase "Book 'em Danno". 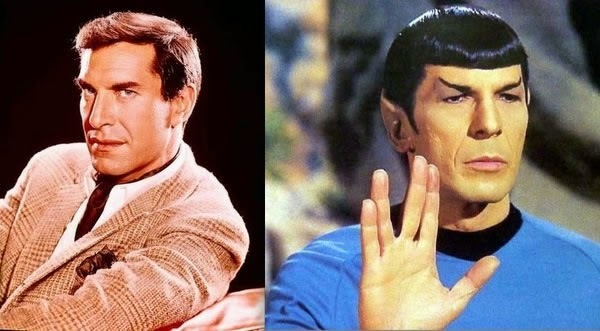 Much more mystifying was the original casting of Spock, largely because it's difficult to imagine anyone other than Leonard Nimoy playing the part, but Martin Landau was in line to assume the role. He was also a familiar face to an American audience and had been in several successful stage productions before being cast in Hitchcock's classic 'North by Northwest' alongside Cary Grant and James Mason. Again there are certain aspects of the actors performance that could arguably fit with Spock's Character. He could seem distant and dispatch his lines without any hint of emotion. He seemed to revel in roles in which you never got beneath the first layer of skin (possibly a reflection of his capabilities or limitations?). It would appear that the only reason he did not accept the part, was the emergence of a new programme that caught his interest - Mission Impossible (1966-1973), where he was cast as a master of disguise - Rollin Hand. Having digested this information, you may want to consider how these appointments might have altered the complexion of the show, or if it would have made any difference at all. 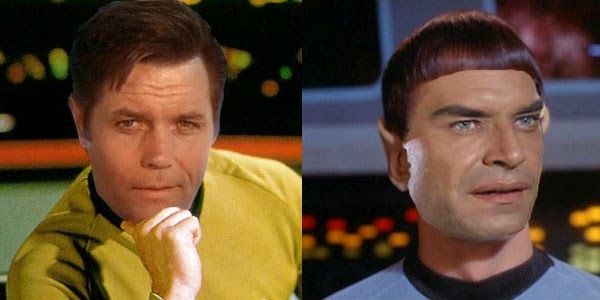 Perhaps Star Trek would have gone on to conquer the Galaxy with Jack Lord and Martin Landau as the two main players, and its astounding success is down to the uniqueness of the idea and visionary scripts. Others of you may think it highly unlikely, and that the chemistry between William Shatner and Leonard Nimoy gave the original series the edge to propel it to the hearts of fans worldwide. Whatever your view, it's an interesting one to ponder. For me personally, the casting of Shatner and Nimoy was absolutely perfect, I'm not detracting from the abilities of Lord or Landau but it seemed that fate intervened in one way or another to gift us with the perfect pairing - but I guess we'll never really know how it may have gone. Next time we'll take a look at the visionary behind Star Trek, Gene Roddenberry.